Welcome to The Independent's live blog on the investigation into the missing Malaysia Airlines jet MH370. We start today with the news that the families of those who were on board the flight are angry over how analysis into debris found on Reunion is being conducted. Last night, the Malaysian Prime Minister Najib Razak announced in a press conference that investigators had confirmed a wing "flaperon" found washed up on the island was indeed from the missing Boeing 777. But French officials, who are leading the investigation in Toulouse, said they needed more time and more analysis before they could provide definitive confirmation. Speaking in Beijing where relatives of the many missing Chinese passengers held a demonstration, Dai Shuqin, sister of one of those feared dead, said: "France is being cautious about it, but Malaysia is desperate to put an end to this case and run away from all responsibilities." "Why the hell do you have one confirm and one not?" said Sara Weeks, the sister of New Zealander Paul Weeks, who was on board MH370. "Why not wait and get everybody on the same page so the families don't need to go through this turmoil?" At a press conference last night, Malaysian PM Razak told reporters: "It is with a very heavy heart that I must tell you that an international team of experts has conclusively confirmed that the aircraft debris found on Reunion Island is indeed MH370." But in Paris, the French deputy prosecutor Serge Mackowiak declined to confirm the debris belonged to Flight 370, though he said there were strong indications that it did. "The very strong conjectures are to be confirmed by complementary analysis that will begin tomorrow morning," Mackowiak said. "The experts are conducting their work as fast as they can in order to give complete and reliable information as quickly as possible." Australia has also expressed surprise that Malaysia has gone ahead and "confirmed" the wing part as being from MH370. Its government, which leads the seabed search for wreckage west of Australia, said only that "based on high probability, it is MH370." Publicly, Australian officials withheld criticism of Najib's announcement, with Australian Transport Minister Warren Truss saying he respected Malaysia's right to make that call, given it is the government in charge of the overarching investigation. "Of course there are still some i's not dotted and t's not crossed. There is still a very small element of doubt," Truss said. "The French are being more cautious. But from the Malaysians, the flag carrier of the aircraft, they are now satisfied that the body of evidence is sufficient to say that this is wreckage from MH370." Privately, however, there were questions about why Najib had moved forward with the statement before all countries had agreed. An Australian government official, speaking anonymously to the Associated Press news agency, said Malaysia wasn't supposed to make the announcement, and had gone out on its own making a conclusive statement before getting the evidence to back it up. The "flaperon" itself is a wing component unique to the Boeing 777, and was discovered - largely intact but covered in barnacles - on the French island of Reunion in the southern Indian Ocean, some 2,800 miles from where investigators have been searching for MH370, at the end of July. The part, along with a burned piece of luggage also found on the island, were shipped to Toulouse for analysis, while the Malaysian government also sent some of its investigators to Reunion itself. Ocean current models suggest it is likely more debris will continue to wash up on and around Reunion, if it is indeed from MH370. What does the wing part confirmed to be from flight MH370 tell us? 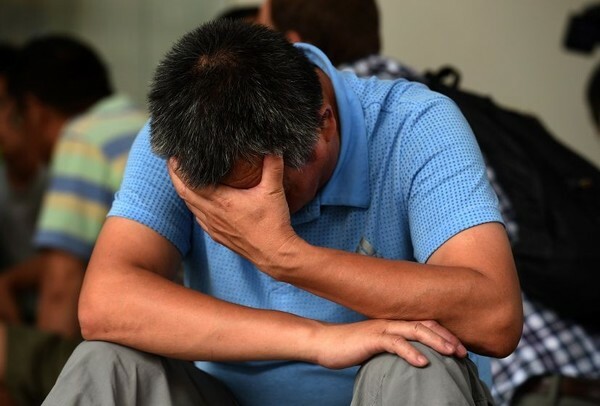 Amid the anger at the process behind Razak's announcement last night, some families of Chinese MH370 passengers have outright rejected the Malaysian Prime Minister's statement. 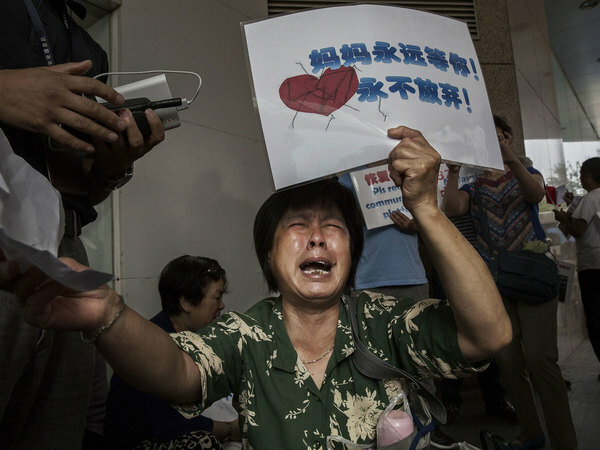 “I don’t believe it,” said Bao Lanfang, 63, whose son, daughter-in-law and three-year-old grandchild were on MH370. Zhang Meiling, 62, whose daughter and son-in-law were on the plane. said of Razak: "I want to kill him. What he said is nonsense. I just want to kill him." Breaking: The Malaysian transport minister has said officials confirmed the wing part is from MH370 because a maintenance seal matches Malaysia Airlines records. DS Liow Tiong Lai, who was appointed Malaysia's new transport minister in the wake of MH370's disappearance, also told reporters that Chinese, Malaysian and Australian officials would be holding trilateral talks to establish what to do next with the search for the plane. Liow Tiong Lai told reporters that Malaysia's investigators in France were convinced that the one of the sealants on the wing part matches "with our maintenance records." He also said the paint colour on the flaperon matches Malaysia Airline's records. Asked about why only Malaysia has confirmed the Reunion island find - sparking confusion and anger from relatives of those on board - he said he understood why the French team had been more hesitant. He said: "We respect their decision to continue with their verification. They have more verification processes to make, the paint, the sealant and so on. "For the Malaysian team, the technical report and maintenance report that we have matched with the flaperon ... The expert team strongly feel and confirm that it is MH370." Breaking: Malaysian investigators on Reunion island have collected a 'plane window' and other aircraft parts, in addition to the wing "flaperon" being analysed in France, transport minister Mr Liow told reporters in Kuala Lumpur. 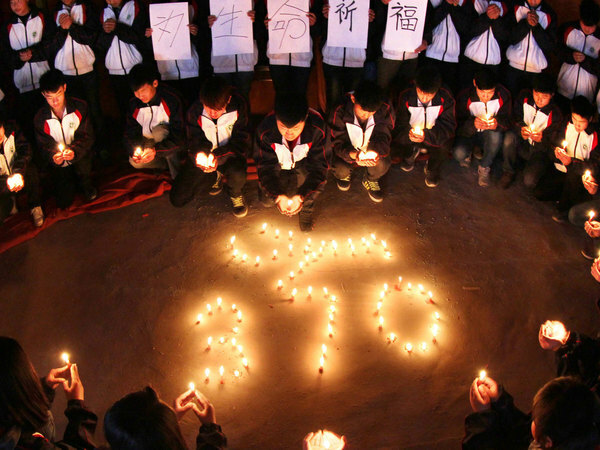 The families of the passengers on board MH370 have expressed renewed anger that they were not informed of last night's development before it was revealed to the world's media. 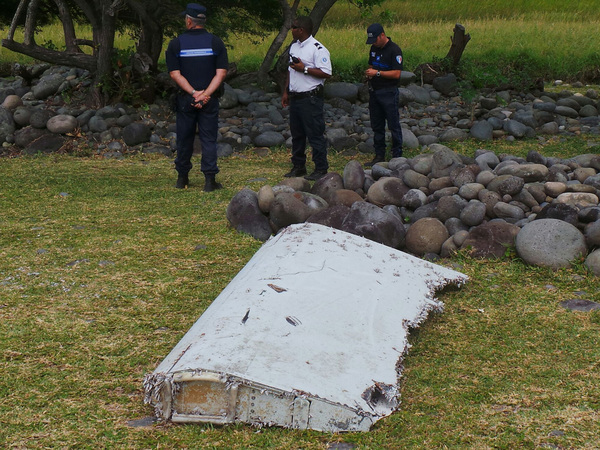 At a televised press conference last night, Malaysian Prime Minister Najib Razak said that investigators could confirm a wing "flaperon" found on Reunion island was indeed the first debris found from the missing Boeing 777. New Zealander Sara Weeks, whose brother Paul Weeks was on board the flight, told the Sydney Morning Herald that the first she had heard of the significant news was when a reporter phoned her up. Speaking from Christchurch, she said she was "yet again" disappointed with how the Malaysian authorities had handled the situation. "It's pretty disgusting, really," she said. The Australian Prime Minister Tony Abbott says that his country will continue to search for MH370 after the developments in Reunion, and insisted that he believes they are looking in the right place off the western Australian coast. He told Melbourne Radio 3AW: "The fact that this wreckage does now look very much like it is from MH370 does seem to confirm that it went down in the Indian Ocean, it does seem very consistent with the search pattern that we've been using for the last few months." He reiterated his determination to get to the bottom of the mystery of what happened to MH370, saying the authorities owe it to millions of flyers around the world. Not all passengers' relatives have reacted to this week's news with anger. For some, it has fulfilled a simple desire to find a physical trace of the plane - and rule out some of the more outlandish theories as to how it disappeared. Irene Burrows, the 85-year-old mother of missing Australian passenger Rod Burrows, who was lost with his wife Mary, said in interview last year that she didn't expect the mystery of MH370's disappearance to be solved in her lifetime. She did say, however: "All I just want is a bit of the plane. It's all I want to know — where they are." For her, Thursday's confirmation went some way towards achieving that. Speaking to the Associated Press news agency from her home in Biloela, northeast Australia, she said: "We're quite pleased that it's been found." More on the latest from Malaysian transport minister Liow Tiong Lai, who said earlier that Malaysian investigators are sending on "many" items found on Reunion island for analysis in France. Mr Liow told reporters in Kuala Lumpur that the possible MH370 debris included a "plane window", "seat cushions" and some aluminium foil, but stressed that they still need to be looked at "by the French authorities for verification". He said Malaysia had asked authorities in neighbouring areas including Mauritius and Madagascar to help comb their beaches for possible debris to widen the search. 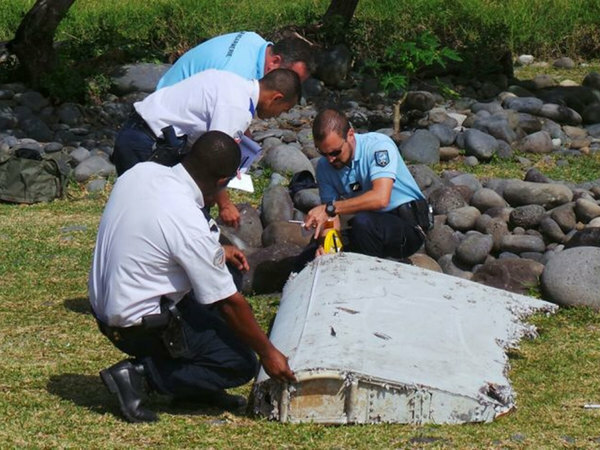 The discovery of a wing part from MH370 on the French island of Reunion has dispelled many of the more outlandish conspiracy theories about how the plane disappeared – but not everyone is going to be put off that easily. Jeff Wise, who writes eBooks about major aviation incidents, shot to prominence among theorists when he suggested that MH370 may have been taken over by “sophisticated hackers” and flown north to Kazakhstan, possibly by Vladimir Putin. He’s written again about the plane in the New York magazine since the first debris was found – suggesting it proves the plane did not come down where satellite data suggest it should have done. “To get so far from the final arc, the plane would have to have been actively piloted,” he says, “because only a conscious pilot could have kept the plane out of a death spiral”. You can read more of what he thinks of the latest developments here. 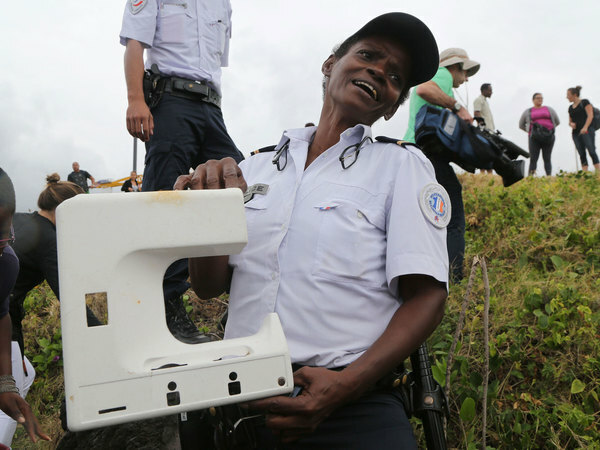 There were initial reports of a possible plane window found on Reunion on Wednesday morning - but the find was treated with some scepticism by local police, who said it could "just as easily be from a sewing machine". Whether it's the same piece of debris as that referred to by the Malaysian transport minister today is unclear - but that previous item was taken away for investigation by officials on the island yesterday. While he refused to be drawn on whether the "window" came from MH370 itself, Liow Tiong Lai did tell reporters: "I can only ascertain that it’s plane debris." The US Secretary of State, John Kerry, who is in Malaysia for meetings of the Association of Southeast Asian Nations, has said he hopes an analysis of sea currents based on the Reunion discovery helps search teams find the remaining wreckage of MH370. He said the news from the French island had reopened old wounds for those involved in the mystery of the jet's disappearance, and added that he hopes the discovery of debris will help bring the families some sense of closure. He also commended the French authorities for their work analysing the plane part. Breaking: The French and Australian authorities have 'joint confirmed' with Malaysia that the wing part found on Reunion was indeed from MH370. Malaysia Airlines has just issued a statement saying that it wants to "convey deepest sorrow to the families and friends of the passengers". "Malaysia Airlines would like to sincerely convey our deepest sorrow to the families and friends of the passengers onboard Flight MH370 on the news that the flaperon found on Reunion Island on 29 July was indeed from Flight MH370. "This has been confirmed jointly today by the French Authorities, Bureau d’ Enquetes et d‘Analyses pour la Securites de I’AviationCivile (BEA), the Malaysian Investigation Team, Technical Representative from PRC and Australian Transportation Safety Bureau (ATSB) in Toulouse, France and subsequently announced by the Prime Minister of Malaysia, Dato’ Seri Najib Tun Razak. "Family members of passengers and crew have already been informed and we extend our deepest sympathies to those affected. "This is indeed a major breakthrough for us in resolving the disappearance of MH370. We expect and hope that there would be more objects to be found which would be able to help resolve this mystery. "Moving forward, Malaysia Airlines’ priority will continue to provide latest updates and information to the families and will fully cooperate with the relevant authorities on the investigation and recovery of this tragic accident." CNN is reporting that, in addition to the evidence of the paint and sealant found on the Reunion wing "flaperon", it also had a serial number which matches Malaysia Airlines records. The IndependentPutting an end to almost 18 months of speculation over the fate of MH370, Malaysian Prime Minister Najib Razak has confirmed that the plane debris that washed up on the island of Reunion in July does indeed come from the missing plane. While confirmation that a piece of debris found on Reunion island is indeed from MH370 represents the first physical proof the plane crashed into the southern Indian Ocean, investigators are still a long way from establishing what caused the plane to do so. Speaking at a press conference in Paris, the French deputy public prosecutor, Serge Mackowiak, said that they are still actively exploring the possibility of terrorism being involved. Our travel correspondent Simon Calder has the full story here. Could terrorists have hijacked flight MH370? 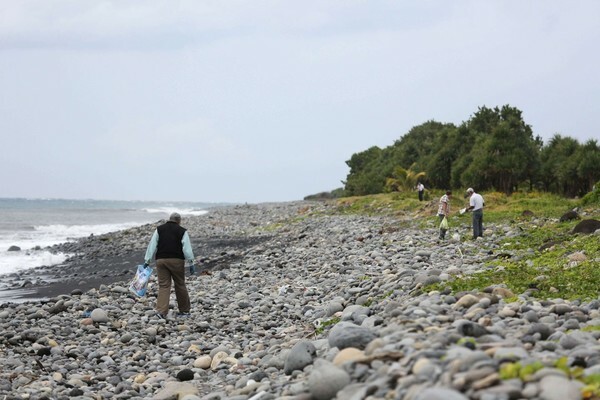 As more debris continues to wash up on the coast of Reunion island, police and investigators are working hard to collect them to see if they come from MH370. One island resident, a lawyer, has been on the beach today, taking pictures of debris. A lot of it is likely to be normal beach rubbish, but some parts could have come from the plane. These fragments are likely to be collected and shipped to France for analysis. 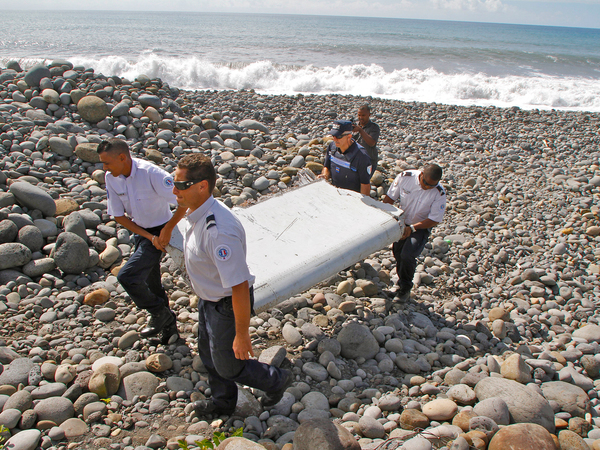 Australia's Joint Agency Coordination Centre, which has been assisting in organising the search, said that since the discovery of the wing part, a "great deal of additional material" that washed up on the island has been handed over to police. For some of the MH370 victims' families and loved ones, the announcement that the large piece of wing that washed up on Reunion did indeed come from the plane will offer a degree of closure. However, some of the victims families have expressed anger and confusion at the announcements, which were made in brief press conferences today and yesterday. Speaking to Reuters, Liu Kun, whose brother was on MH370, said: "We suspect that the plane wreckage could be faked." The Malaysian Prime Minister, Najib Razak, said the debris was definitely from the plane - whereas French officials within the investigation are being more cautious about making solid conclusions. Kun said that "Malaysia is desperate to put an end to this case and run away from all responsibilities." The US National Transportation Safety Board (NTSB) and Boeing have seen the large piece of debris, but are not yet fully satisfied that it came from MH370. Unlike the Malaysian Prime Minister, who last night said that the wreckage, believed to be a flaperon, definitely came from MH370, are waiting for further analysis before making a definite confirmation. It's worth noting that the NTSB very rarely come to conclusions like these lightly - it will take a lot more investigation until they are fully satisfied that the piece of debris came from MH370. Relatives of MH370 victims have been outside the Beijing Malaysia Airlines office, waiting for any more news of the plane. They have been present at the office since the plane disappeared, but there was large and angrier crowd there after the announcement from the Malaysian Prime Minister. How can the Malaysian authorities be so sure that the debris came from MH370? While the Malaysian Prime Minister said that the wreckage definitely came from the missing plane, French investigators and officials from Boeing and the American National Transportation Safety Board were less keen to make a solid conclusion. Malaysia's Transport Minister Liow Tiong Lai, explained: "From our first observation, the color tone and all maintenance records that we have, we know." "Our records show that it's the same as MH370." He added that there are "many other technical details that I do not have to reveal" that confirm the part is from Flight 370. Amidst some conflicting reports on the origin of the debris, the BBC have compiled a handy list of what each group involved in the search and investigations say about the flaperon. Malaysian PM: "Experts have conclusively confirmed that the aircraft debris found on Reunion Island is indeed from MH370." Malaysia Airlines: "This is indeed a major breakthrough for us." French investigators: "There exists a very high probability that the flaperon indeed belongs to Flight MH370." 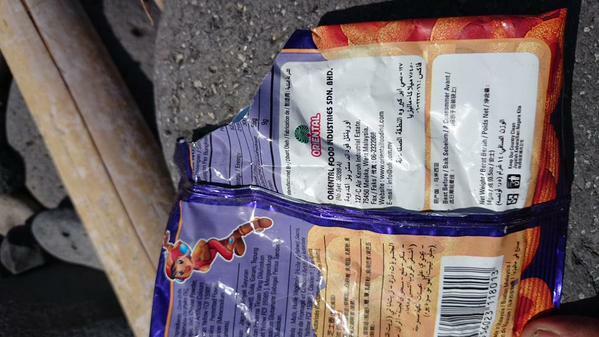 Australian PM: Debris "does seem to indicate the plane did come down more or less where we thought it did". Australian search team: "It is heartening that the discovery of the flaperon is consistent with our search area." 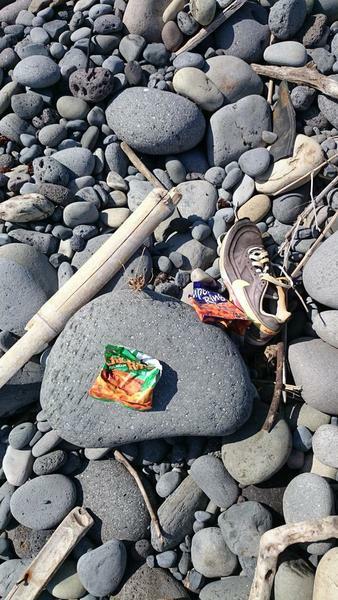 Debris that could be from MH370 continues to wash up on the coast of Reunion. The Malaysian Transport Minister, Liow Tiong Lai, has said that debris that they believe to be window panes and seat cushions has also washed ashore. They will be taken for analysis to see if they are indeed from the missing plane. With investigations into the flaperon still going and no more major announcements scheduled, it seems like a good time to wrap up the liveblog. The mystery of MH370 is still far from solved, but The Independent will continue covering news of the investigation as it progresses.